Offering you a complete choice of products which include vhdl simulator. 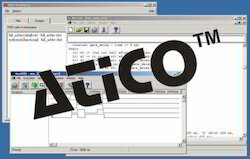 Advanced Technocracy Inc. is Manufacturer, Exporter & Supplier of VHDL Simulator. Learn VHDL the Direct way with our low-cost, interactive VHDL simulator. VHDL simulator is built around a VHDL interpreter that allows you to edit and simulate your VHDL design without complicated setup or compilation procedures. VHDL simulator simply loads and simulates in one step. · An advanced editor providing syntax coloring and syntax-error detection. Perfect for beginners, this editor highlights syntax errors as you type! · Allows you to simulate and debug your design with a graphical waveform viewer. · Provides an easy introduction to the VHDL language. · Windows 95,98,Me,NT 4.0, or 2000, 15 MB hard disk space, 64 MB RAM. · Training Kits for Virtex, Spartan 2S, 2SE, CPLD, FPGA, Altera. Looking for VLSI Lab ?